Use these tips for what to buy when your finances are tight, so you can stretch a $20 grocery budget for the week. 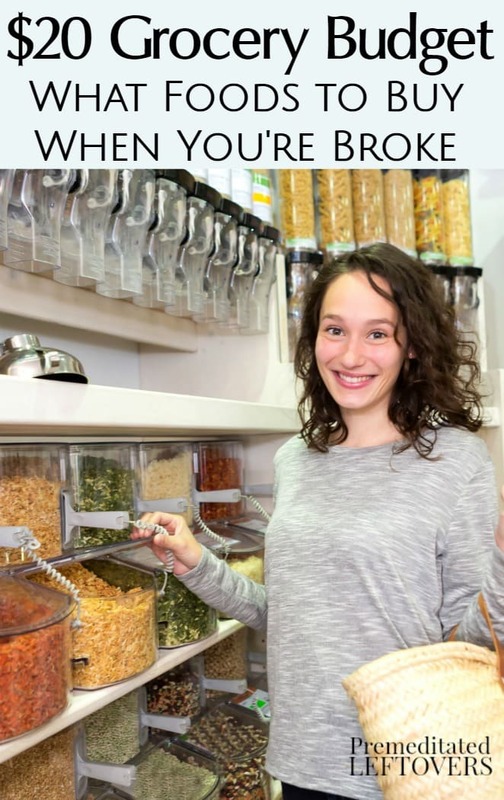 There have been many times in my life, especially when I was living paycheck to paycheck when I was younger, that I found myself with a very small grocery budget. Even as low as $20 at times. This feeling of food insecurity is incredibly stressful. If you find yourself in it, you may be wondering what you should buy when you only have $20 for food to feed your family for the week. Here are some ways to stretch The $20 Grocery Budget as far as possible and what you should get at the store to provide good meals. You don't need to buy everything on this list at once as it exceeds $20, but the items here will help you get the most out of your budget. Beans – Beans provide a great source of protein and are filling. And they can be used in so many ways from rice and beans to wrapped in tortillas for a bean burrito. If you happen to have any meat in your freezer, you can add beans to any dish to stretch the meat out further as well. To get more for your money, opt for dry beans and the skip cans. Rice in Bulk– Rice is another good filler that provides a great source of grain. Rice can be added to other things to create casseroles, soups, and wraps. You can buy several pounds of rice for less than $2 in the bulk section of most stores and a little goes a long way. Bananas– Bananas are almost always the cheapest fruit no matter what season it is and they are a great source of potassium. You can also use bananas to create sandwiches with a little peanut butter for a good filling lunch. Potatoes – Like rice, potatoes are good for fillers in casserole dishes. Potatoes also can be made so many ways because they are versatile. Tofu- This is not a common thing you see on many lists like this. Many people think it's expensive or they are afraid to try it. The truth is, tofu is an excellent source of protein and it is usually very low cost. I can get an entire brick of it to feed a whole family for less than $2. Compared to meat, this is a big money saver. Frozen Vegetables- If you stick with the basics like peas, green beans, and corn, frozen vegetables are usually cheaper than fresh and have more nutrients and less sodium than a can vegetable for often the same price. They work well in casseroles, soups and as a side. Canned Tomato Puree- I buy this all the time for many things and at places like Costco, you can get a gallon can of it for around $3. You can make a huge pot of spaghetti sauce or chili and use the leftovers for another meal. Eggs- Eggs have gotten reasonable in price again and they are an excellent way to fill up and do it for cheap. Eggs only cost around 20 cents each or less, so they can be a great option when you are broke. Green Onions– If you can afford to throw these in there, they are great for adding some flavoring to things for a low cost. They are only about 50 cents a bunch most of the year and you can also regrow them a second time with no garden at all! All you do is cut the onions down to just above the white roots and place the roots in water in a semi-sunny spot. No dirt necessary! In a couple of days, you will have regrown green onions! Oats in Bulk – Buying quick oats in bulk is a great way to have a filling breakfast every morning and it is super low cost as well. Jazz it up with some maple syrup, brown sugar, raisins, or fresh fruit if you have any. If you want fresh fruit or vegetables, make sure you shop in season. You will find that the produce that is in-season will be much more inexpensive than out of season produce. Don't be afraid to ask for help from a food bank. There were many times I would go ‘shopping' at the food bank before going to the store so I could buy less at the store with what I got in my food box. If you have no way to get to a food bank and that is what is stopping you, consider asking if they deliver. Many small food banks do. Coupon if you can. Look for coupons for the items you plan to buy. I have seen coupons for many of the things I listed above including eggs, tomato puree, tofu, and frozen vegetables. The less you have to spend, the more you may be able to get. Supplement some meals with soup kitchens. Many people don't realize that soup kitchens are not just for the homeless. Anyone can go eat at them and often, it's some great homemade eats. If you get lunch taken care of there, you only have to worry about dinner. Prepare Homemade Foods- Making bread is much cheaper than buying it (as is a lot of meals). Make what you can at home rather than buying convenience foods. You will stretch your dollar a lot further. If you have a food processor or grinder, you can process oatmeal into flour. There are recipes using oat flour or you can substitute regular flour if a recipe only calls for a bit of flour (1/4 c or less). Oats are so healthy especially for diabetics. My city is not known for being ahead of the curve but we do have community gardens. If you have any lawn that will grow vegetables, contact a group and offer. You can participate and reap some for yourself. If you don’t have land but have some time, participate on another property. If you haven’t grown vegetables before, read up on it and tell the group you are a newbie so they can help you. Regular onions, and garlic, can also be used for their greens, which will extend their usefulness if they are already sprouting. I’m not sure about ginger but I have put the sprouting nodes in a pot of dirt. 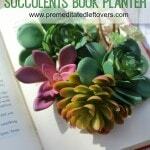 There is information on the ‘net about all the vegetables that can be put in water or a pot to regrow. This includes celery and most herbs. Herbs are awesome sources of nutrition and boost/change flavour for regular dishes. Bread makers are often available second hand so you can make bread without an oven or without heating up your home in hot weather. Same goes for slow cookers. They are great for beans or tougher, cheaper cuts of meat. Please be aware that kidney beans must be well cooked to neutralize a toxin in them. If you have access to bulk buying, beans, grains, nuts and seeds add protein, texture and vitamins. In Canada we have Bulk Barn where all these and more are readily available. Watch out for nuts as they can be expensive. Don’t forget that you can change your mind when they are rung up! One last suggestion is to join with people in the same situation. Making big batches of food takes little more time and you can make use of bulk items (even fruits and vegetables from those reduced to sell fast). Each person can make something and swap a portion for a portion of something another made. You can grow a variety of food in a small yard or patio with containers saved from canned food. Another pin,also shows how you can grow vertically in shoe pockets. Also hanging baskets. Save seeds and roots and plant them. A lot of food can be grown over time by using these methods. And don’t forget using vegetarian food scraps to make compost or compost tefrown organic free fertilizer. Never ever use chemical products and always look for ways to FIT, as farmers did for 10,000 years before commercial products were manufactured.. When I was a kid we lived out in the country and raised a lot of our food. We had a huge freezer and Mom filled it with corn, green beans, and peas we’d grown. We raised our own pigs which became sausage, tenderloin, ribs, hams, shoulders, etc. I still look for bargains when I shop-most of the stuff I buy has a ‘clearance’ sticker on it. Either cook it or freeze it immediately. A great cheap source of protein is beef liver- it’s about the cheapest thing in the meat cooler these days, and the drippin’s make the best gravy going. Make soup to use up leftovers- that single portion of green beans, left over hot dog onions, a potato or 2, beef or chicken soup base, and you’ve got soup! Stretch it by adding cooked rice or noodles…Good Eats! I like that you’ve put tofu on your list. I love it and use it regularly. When I was in college and had a limited budget, I would make soups out of leftovers so as not to waste anything. Soup can be stretched to feed lots of folks. In addition, I would often buy fruit when it was marked down and what I couldn’t eat, I’d often turn into a syrup for my pancakes. Even now I keep lots of rice around because it can be eaten for breakfast as a hot cereal. Sometimes I take left over rice and turn it into fried rice with left over veggies. Or I’ve been known to take little bits of rice and add them to my clean out the fridge soup. You forgot to mention rice pudding. I worked for two Food Brokerages. Canned food is processed at the same plant and different labels put on the cans. There is no difference in the food inside. Some people think they have to have the name brand foods but just remember the above. My husband use to be an OTTD and he picked up canned foods from big plants and hauled them across country to different stores. He said the same thing, the only difference in the foods inside the cans are the labels on the outside of the cans. And the price $$ st the store. I shop Aldis first, then hit the loss leaders at local grocers. Always stock up on sale items you use regularly, when possible. Instigate a soup night once a week, breakfast for dinner, leftover night ( we called it buffet night) and we made pizzas from scratch using the bread machine I got as a gift one year for Christmas. We raised 5 kids on one income. It was tight, no public assistance. But I see these frugal ways manifested in our 3 daughters today. Thank you for this article. Blessings. Green onions can be bought once and save the bottoms. Place them in dirt. If you don’t use them, they can grow to be over an inch around. Dehydrate some for winter if you live north. I the south they can last all year for fresh. 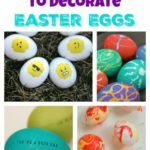 Just wanted to stop by and let you know you’re featured on Inspire Me Monday as the most popular post. 🙂 Congrats! 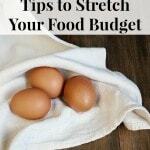 What creative ways to stretch a tight budget! I really appreciate your tips. I think people assume that eating cheap has to be unhealthy, but it’s so much cheaper to buy beans, rice, and oatmeal than package and processed foods because you get so much more. Pair these staples with milk and seasonal produce and you can eat healthy for way cheaper than buying frozen pizzas or sugary cereals. Sometimes you may know someone that has extra in the garden and you can get food that way too. I was inspired to think about shopping with only $20 when Gwyneth Paltrow tried to do it. It’s much easier than we think – maybe not as much variety initially but as you come across more good deals on food items that last longer than your week then you will see more variety. One thing I wish was more popular is seed sharing. I never use all the seeds in one packet and it’s easy to create your own free garden if someone gives you extra seeds. There is a site called home gardening that trade seeds. I bought eggs for 67 cents a dozen today! One of my faves is fried rice. The eggs, the rice and the green onion are ALL on your list! Shopping at a Mexican/Latin market can save you, too. Spices, fruits and vegetables, rice, and other food staples are often noticeably less expensive. If you don’t have one near, even check out the ethnic foods aisle at your local grocery store. Same product with a Spanish label and cheaper price! The crock pot is my best friend. Buy whole chickens on sale. I put the whole chicken in the crock pot with a little seasoning. If it’s a particularly big chicken you might have to quarter it first. No water necessary for a basic chicken. 4 to 5 hrs. later that chicken is then deboned and shredded, placed in freezer bags in individual meal portions. Super easy to defrost and add to anything. But that chicken keeps on giving. Place the fat/juice into the fridge until it separates. Add the juice, bones and organs (heart, liver, etc) and make stock (or broth). Use to make soup, or freeze in ice cube trays to use later. Having soup once a week with homemade flat bread or corn bread is a great way to stretch your food budget. We really need to bring back basic home ec and shop. I was repeating to myself “Please don’t say ‘beans, rice and/or pasta’ “but there they were. Growing up being raised by a single mother with two other brothers and sisters, we had these staples nearly every single night. I understand they are inexpensive and can feed a family several meals for weeks. I abhor these. Bean, Rice, and pasta never cross my threshold. Vegetables on the other hand are plentiful along with chicken and ground beef. Actually, pasta was not on the list. 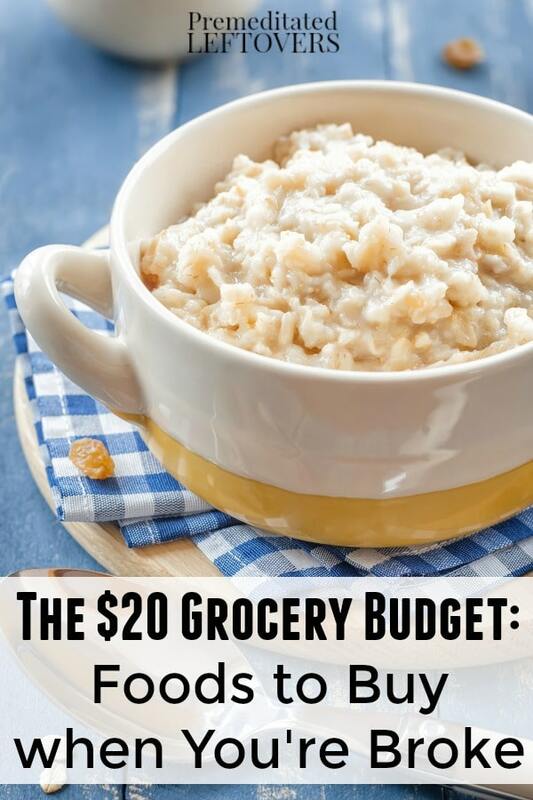 This is a $20 budget for those who need to find the cheapest food to feed their families in tight times. We would be remiss if we did not add beans and rice. I lived on a bag of potatoes for a week when I was in my twenties because I was able to buy a bag of potatoes for .99 cents. Sometimes you do what you have to do. And when you can move beyond the $20 budget you give thanks! I grew up in a family of 10. My father died when I was 10. Mom only had 100.00 a month to live on to pay electric bill, gas bill, and house payment. She was 34years old. Sometimes food was scarce and we ate the peelings of the potatoes fried in grease because I got home late and all the potatoes were gone. My brother ate ketchup sandwiches and we put mustard and butter on bread and called it cheese. Mama made her own bisqick mix and we learn to make brownies from it. There was no welfare then only commodities. We survived. God saw us thru. Boil potatoes for mashers or whatever, but spoon the cooked potatoes out of the water and save that pot full of potatoe water in the fridge. All week long, scrub all your veggies and put all the peelings and root ends into that soup pot. Scrape your empty dinner plate bits, bones and bread crusts in there too. Meanwhile, start an empty jar in the freezer and try to save one spoonful of veggies, a bit of gravy, whatever, from every meal. At the end of the week boil the heck out of the scrap pot, strain out the inedible scraps, add the tasty jar of frozen leftovers to your nutritious broth and enjoy. Not suitable for company, but perfectly good for spouses and their breast fed children. I live on disability and food stamps[believe me it was not a choice] and have had to learn how to really stretch. I buy meat only on sale, and now is the time for really cheap turkeys and most stores will cut them in half for you and you can get up to six meals for four from half a turkey and I never run out of beans. Usually If things are getting really tight a make a pot of vegetarian lentil or split pea soup.I also never throw out leftover veggies they go into a lrg. container in the freezer.When that is full it becomes a pot of veg. soup. The same works with any leftover meat.. It is very satisfying to hear younger people tell how to tighten their belts! This is the most sensible and realistic article I have read about eating cheaply. Well done. Don’t forget shopping later in the evening means you can get those 50% off $10 ready cooked chickens. An absolute steal at $5 and no cooking costs and once the meat is eaten boil up the bone for a stock! These are awesome tips. Sometimes you just have to get creative with what you have. When you have a family to feed, it can be challenging. Food is easily our biggest bill besides rent.